The rumour mill hasn’t paused for breath but there is more genuine cause for fans of the Transformers movie franchise to get excited. 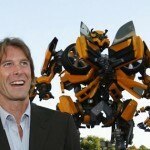 Michael Bay is now believed to be in the final stages of negotiations to direct a fourth Transformers movie. Just a couple of months ago, we knew that Paramount wished to render his services once again for not one, but two new movies. They obviously peaked the interest of the director as it is now close to being confirmed – despite Bay insisting that DOTM was to be his last foray into the Transformers world. An insider, who has some familiarity with this situation, warned that although there is no closed deal in place between Paramount and Bay, the studio is close to closing one. We could expect an announcement as soon as next week. Details of the next instalment are being kept firmly under lock and key but we have already been told that it is definitely not a prequel. What we can expect is that it will show us some of the older characters and give us a more in-depth look at the history of the Transformers. Although average fans of the franchise may not be too concerned about some of these the characters that never really had a major role, they will offer a sentimental factor to fans of the original series. Reports still suggest that Bay will be directing Pain & Gain before returning to his cash cow but should a contract be done and dusted, he will likely start working on the fourth movie at the end of 2012.